Sometimes you do not know a good gift idea until it hits you on the head. This is what semi happened to myself. 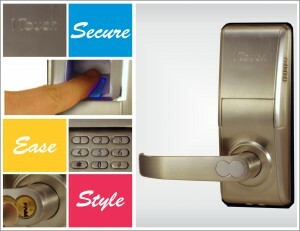 Throughout the year we have had many realtor agents call and order multiple fingerprint door locks. It wasn’t until I was speaking to a particular agent that seemed to purchase quite a few that we began discussing the motives behind purchasing so many locks, and not for herself. She had decided at one point to go beyond the typical new home owner gift. You know the balloons, flowers, gift basket full of fruit. After trying many things she thought would bring a huge AWWW, you really care, she decided to try a new door lock, but not an ordinary door lock. She began to purchase the 1TouchIQ2 single latch lock or a BioBolt X2 deadbolt for her new home owners and gave it to them during closing. The fingerprint, pin code and key locks provided her new home owners with such joy! She gave them a piece of new technology, security and the freedom to never change their keys again. It became a marketing tool itself. She gained lots of new clients through the new home owners. If you’re looking for a unique way to say thank you and show your appreciation to the new home owners, look into a fingerprint door lock.